A woman walked into the Kardashians' DASH store on Thursday morning and pointed a gun at an employee then returned later with a machete, shouting that she was going to kill the entire Kardashian family. 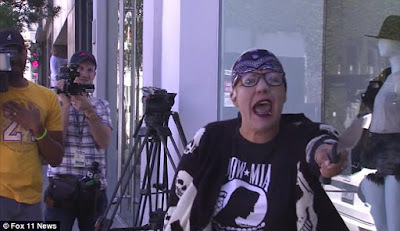 The woman then continued threatening and ranting on the sidewalk outside the shop in West Hollywood, California and it was captured on video. The woman was dressed in all black. Her black jacket was decorated with white skulls and she had on a bandana while she held up the machete in the air and yelled threats. "The Kardashians will be executed if they step on Communist territory! They'll be f***ing killed!!!" she said. Someone then asks her to keep shut and she threatens to stab the person. She left the machete in the doors while leaving after her rants. Sheriff's deputies in Los Angeles say the same woman had earlier entered the store and pointed a gun at an employee behind the counter. She then knocked items off the counter and said: "Stay away from Cuba." The Kardashian family faced criticism last year after taking a trip to Havana, Cuba, where they filmed scenes for their E! series Keeping Up With The Kardashians. There were no injuries reported. As the woman left, she warned local media crews gathered outside the store not to follow her, that she had a gun. Police are still looking for the unidentified woman.